Click Here to See Our 5-STAR Reviews! Why Do Wheel Bearing Problems Occur in Minis? Mini Coopers are designed to be stylish and smooth. When you have a wheel bearing go out on you, that smooth ride is replaced by a noisy experience that makes every drive sound like a trip down a bumpy road. 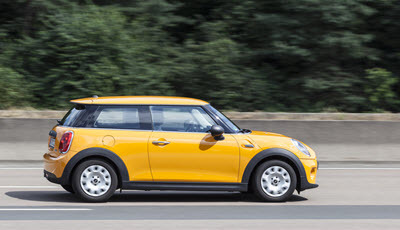 What are wheel bearings and what can you do about the noise they make in your Mini? Wheel bearings have the task of reducing friction between your wheel and your hub. They are small steel balls that fit inside a metal ring, which is called a race. Instead of two blocks of metal trying to spin together, with multiple points of contact and friction, these round balls ensure that there is contact all around, but that the contact is minimal due to their perfectly round shape. This connection between the wheels and hub, made with the least amount of friction possible, allows your wheels to spin as fast as possible. Unfortunately, the wheel bearing is basically a wear-and-tear part, meaning you’re likely to need to replace your wheel bearings at some point or another over the life of your vehicle. To help ensure they last, be sure that your mechanic looks them over and lubricates them as needed during regular maintenance. Bad tires can also cause damage to bearings, so try to make sure your tires are changed as soon as they begin to wear unevenly. If you have ever driven over a rumble strip and heard a rhythmic thup, thup, thup…like the sound of a helicopter flying by, you know the sound of a bad wheel bearing. It is a constant sound, whether you are driving on a rumble strip or down a smooth highway. The difficulty in detecting a damaged wheel bearing is that you can only hear the sound while you are driving. Often, you must be driving near 40 miles per hour before the sound begins in earnest. If you want to try to find out which wheel has the damaged wheel bearing there is an easy way to test. While driving down the road, fast enough to hear the rumble strip sound, ease your Mini slightly to the right. Then ease it somewhat to the left. As the weight of your Mini shifts from one side to another, you may be able to hear the sound getting louder or quieter. Whichever direction makes a louder noise is the side that you will likely find the broken wheel bearing. How Do You Fix a Bad Wheel Bearing? Before getting over excited and taking apart your wheel, you should first check your tires. If your tires have any spots that appear to be worn away more than the tire as a whole, in small patches, for example, it may be your tires, not your wheel bearings causing this noise. You need to rule out your tires before assuming the problem is your wheel bearings. The most thorough way to find a damaged wheel bearing is to get your car on a lift, have someone accelerate to 40 miles per hour, and use a stethoscope or a long screwdriver to touch to the wheel hub and listen for the noise. As you can probably tell, finding and fixing a broken wheel bearing is not an easy task. It is difficult to do alone, and it may require a press to get the bearing into and out of its nesting place in the hub of the wheel. For this reason, some people just replace the entire hub and bearing piece together. This is easier, but not necessary. Having a mechanic replace your damaged bearing may be a bit expensive, but it is primarily due to the labor-intensive task of finding and replacing them. Fortunately, damaged wheel bearings do not have to be replaced immediately, so you have a little time to save up a little extra money to pay for the repairs if you can tolerate the noisy driving for a few weeks. Revolution Automotive Service has served Boston, MA in the areas of Norwood, Westwood, Walpole, Sharon, Canton, Medfield, Needham, and Dover, with excellence for years, and we have received 97 five star reviews from our clients. We have some of the best ASE certified Mini Cooper mechanics in Massachusetts and offer you a three year or 36,000-mile warranty on our services. Revolution Automotive Service knows that Auto service is more than just fixing problems in your vehicle, it is about providing you quality service. If you bring in your car to have your wheel bearings checked, we will hand-wash your vehicle to show you the kind of quality care we will give your car and our appreciation of your business. Check out our website and schedule an appointment with Revolution Automotive Service today. * MINI Car on Road image credit goes to: typhoonski. today for your auto repair needs! Why Does the Camshaft Tensioner Malfunction in Audis? Located in the Norwood area, we service the following communities: Westwood, Walpole, Sharon, Canton, Medfield, Needham, and other surrounding areas.